Well its been a while since I've blogged but I needed to knuckle down and get some training done ahead of Austria. All was going well until Wednesday when on an easyish 40 minute run, something hurt in my knee after about 20 minutes, I turned and headed for home and thought nothing more of it until I could barely walk on Thursday. Here I sit writing with Austria a mere 7 days away and I am unable to run. This worries me a bit but as a fellow competitor said, "You can nearly walk a marathon in 7 hours." I am hoping that rest for this week helps my knee recover. I am more annoyed because last week I managed a 17 mile run at a fairly even pace. Apart from first mile over exuberance my miles were quite consistent. I averaged 9:47/mi across the whole 17 miles. Yes it wasn't pretty but I got it done. This is only the third time in my life that I have run over 13.1 miles. I really don't do enough running. So in 7 days I hope to complete Ironman Austria with a pain in my rib as a result of #turbogate (where I fell off my turbo trainer) which prevents me from getting aero on #Rinnie and a problem with my knee which prevents me from running. Wow this is going to be fun. Lets hope the next seven days of rest results in me being able to get aero on #Rinnie and being able to run. Otherwise it will be a really long day at the office. I'll be that bloke on the TT bike who spends the entire ride on his bullhorns who then has to walk a marathon. 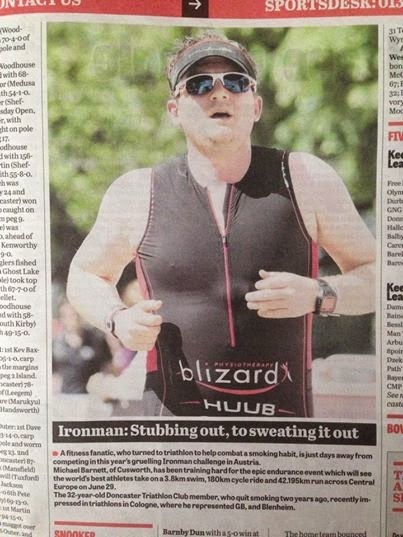 Doncaster Free Press put a photo of me in the paper this week. It was a nice surprise and completely unexpected.